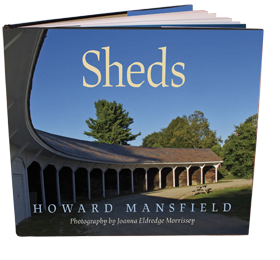 The title of Howard Mansfield’s panoramic book “Sheds” holds far more persuasive power than its simple five-letter title. And Joanna Eldredge Morrissey’s supporting photographs are mesmerizing. His sheds range from maple sugarhouses to meetinghouses. Her camera catches covered bridges to farmhouse connectors. Never a dull moment in this full-color compendium of surprises. Part of the attraction comes from Henry James’ book design of many full-book photo spreads edited onto coated glossy pages. No e-book version could compare. Superbly illustrated throughout, Sheds is an extraordinary and unique study that is as impressively well written as it is exceptionally well organized and presented. Simply stated, Sheds is unreservedly recommended for both community and academic library collections, and will prove to be of special interest to students of architecture as well as non-specialist general readers with an interest in the variety and utility of these relatively simple structures. Sheds are simple constructions upon which the author has built complex meditations. Howard Mansfield, historian-preservationist-philosopher, has expanded a chapter of his Dwelling in Possibility: Searching for the Soul of Shelter (2013) into a pictorial survey of a familiar sight in New England, the boxy add-ons to the built environment that provide spaces for particular functions, or a series of functions. The materials, sizes, and purposes of sheds vary, but their qualities of flexibility, adaptability, and agelessness are the same. Mansfield lets his exploration of ideas wander over the varieties: meeting houses, connected farm buildings, covered bridges, summer cabins, bob houses (known elsewhere as ice fishing shacks), sugar houses, even A-frames. He mentions “anti-sheds” (abandoned and falling down by stages), and re-purposed “war sheds” (Quonset huts). He explains why bridges became covered, and plain meeting houses morphed into churches with spires. He recalls that the competition of Midwestern farmers prompted New Englanders to spruce up their outbuildings and make them more efficient by attaching them to one another. He describes how lakeside structures often are either floated or drawn over ice to serve another purpose on the opposite shore. The author has gone beyond standard research to harvest comments of architects and local builders. He has probed for meanings and feelings about these shelters… Morrissey’s photographs are of high quality. At first I noticed repetition, but gradually I realized the slightly altered perspectives added to my arm-chair experience of being in the landscape. Sheds will appeal to readers who like the coffee table style of book, as well as to those wanting a dose of history and philosophy to expand the illustrations. The balance of photos and text is just right, neither one overpowering the other. Howard Mansfield is a wry and perceptive commentator on the built fabric of New England…. Sheds is a fun and informative romp through structures that were not designed to be looked at. A 2016 Forward Reviews Book Awards finalist in the photography category.